This spring, as members of the Class of 2012 accepted their hard-won places at the College, alumni in five cities gathered for an inside look at the extraordinary undergraduate experience awaiting Dartmouth's next entering class. Carol Folt, dean of the Faculty of Arts and Sciences and the first holder of the Dartmouth Professorship in Biological Sciences, has been on the road, shining a “Spotlight on the Classroom.” Sponsored by the Alumni Relations Committee of the Dartmouth College Board of Trustees and organized by the Office of Alumni Relations, “Spotlight on the Classroom” sessions in New York, Boston, Washington, Los Angeles and San Francisco have given alumni a glimpse of what goes into creating one of the world's premiere undergraduate learning environments. Other members of the faculty, including Mike Mastanduno, the Nelson A. Rockefeller Professor of Government and associate dean for the social sciences; Katharine Conley, professor of French and Italian and associate dean for the arts and humanities; and Louise Hamlin, professor of studio art, have joined Folt along the way. “Innovation, impact, and interconnection—three powerful words,” said Folt, opening her remarks in New York. “that describe the world students and faculty experience at Dartmouth today. The campus is exploding with their energy and optimism” she continued. In more than two decades at Dartmouth, Folt has never been more excited about the College's prospects than she is now. “We feel privileged by the students who come to Dartmouth to study with us,” she observed. “Before they even come to campus, they have shown a passion for learning. They want to excel as scholars, and are ambitious and committed to quality and independence,” she continued. “They expect to work with and know personally faculty who are themselves leaders in their fields. They arrive at Dartmouth having been leaders in many areas at home and they want to leave Dartmouth prepared to lead in the world. “Our students should have learning experiences that are personalized and flexible,” said Folt. 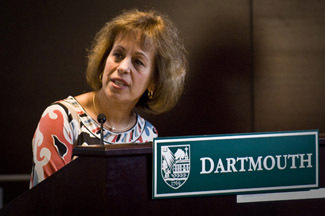 “We want them to study with scholars from many different backgrounds—in the Arts and Sciences and also increasingly with faculty from the Dartmouth Medical School, Thayer School of Engineering, and the Tuck School of Business,” she said, adding that a tremendous amount of strategic thinking goes into how Dartmouth can best meet that challenge. Interdisciplinary courses—a hallmark of Dartmouth's history and facilitated by its scope and size—now number 156 (there were 81 in 1998) and span departments, divisions, and schools. In addition, the College issued roughly one thousand credits for students' one-on-one work with faculty last year. “And this includes all forms of learning,” said Folt. “Student and faculty work together to crea te: new discoveries in all fields, works of art, music, poetry, design new materials, computational tools, develop policy papers, critically analyze theories, and work toward new syntheses — experiences that take students beyond classroom learning, to being a person of that discipline.” Through new hires—the faculty has grown by 56 tenure-track positions in the last 10 years—and the addition of new courses, the College has been able to keep 65 percent of classes under 20 enrollments (up from 57 percent in 1999); only 8 percent had enrollments over 100 in 2007-08 (down from 11 percent one decade ago), Folt noted. 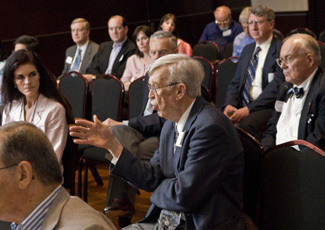 David Hitchcock '50 and fellow alumni at the Spotlight on Classroom discussion in Washington, DC, in April. “Spotlight on the Classroom” sessions included time for participants to question Folt and her colleagues. In Washington, D.C., for example, David Hitchcock '50 asked about maintaining quality control when new classes are added to the curriculum. Mastanduno explained that every new course proposal goes through a review process that includes both a cross-disciplinary Committee on Instruction and a divisional council of department chairs; external reviews by outside experts may also be used. Bob Davidson '67 inquired about how the evaluation of teaching is used in tenure decisions. Mastanduno noted Dartmouth's singular practice of including a strong teaching evaluation component: among other elements of the process, 80 to 100 of recent graduates are asked to contribute written reflections on what a faculty member up for tenure contributed to their education. Before creating the Spotlight series, the Board of Trustees Alumni Relations Committee spoke with members of the Alumni Council's Alumni Liaison Committee, the Association of Alumni Executive Committee, the Class Officers Executive Committee, the Club Officers Executive Committee, and Affiliated Group presidents to learn alumni views. The number one topic on the minds of alumni was identified as the state of undergraduate education at Dartmouth today, said trustee Brad Evans '64, a member of the board's Alumni Relations Committee. Later this year, the committee—which is led by trustee John Donahoe '82, and also includes trustees Ed Haldeman '70 (board chair), Christine Bucklin '84, and Peter Robinson '79—will write a report that will be shared with the rest of the board and alumni at large.